On this auspicious day we celebrate not only the beginning of Spring, but also the Iranian New Year. One of my absolute favorite times of the Year. The flowers are blooming and the birds are singing. The sun warms our bodies and homes. A time of rebirth which t is reflected in many areas of our lives. In this picture we see what is referred to as the Haft-seen. In Farsi, it refers to the seven “s’s”. Each table setting represents 7 different items that start with the letter (Seen “س”) in Farsi which serve a particular purpose. An intention for the New Year that is beginning. So what do they symbolize? “Sib” (Apple) : symbolizes health and beauty. “Sabze” (Grass) A symbol of nature and rebirth. “Senjed” (Sea-buckthorn): Holistically Senjed was utilized to invigorate the brain and memory, and symbolizes wisdom. “Serkeh” (Vinegar): symbolizes age and patience. 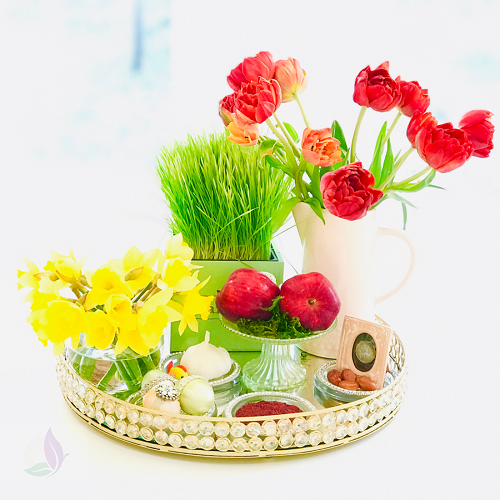 “Samanu”: is a sweat paste made from germinated wheat, which is specially prepared for Nowruz. It is a symbol for affluence. “Somaq” (Sumac): Sumac is a symbol for patience and tolerance. A few coins represent prosperity and wealth. A goldfish in a bowl represents life and the end of astral year. Rose water known for its magical cleansing power. A mirror that represents a field of possibilities where the creative force reflects and makes everything possible. May this New Year be one that brings all of your most desired wishes come true with much health and love!